From Main menu, click "Fly Features". 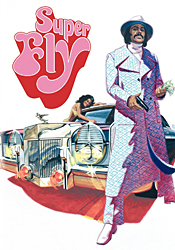 �Then highlight "Curtis Mayfield on Super Fly" and press the right direction arrow on your remote. The boot of the black woman on the screen will light up. �Press enter to play a clip called "Behind the Hog with Les Dunham". �Dunham describes how he designed the car used in the movie.